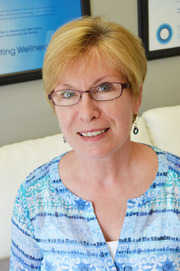 Hi, my name is Donna Perry and I am the senior chiropractic health assistant/office manager, at Fredericton Family Chiropractic. I am proud to say that I have held this position for over eleven years. Another title for my position is patient advocate. It is my job to make your visit here a great experience. Your health and well being is our priority, and it is our goal to help you and your family reach your maximum health potential. We have an amazing wellness clinic and staff here at Fredericton Family Chiropractic. We truly are a family and consider our practice members to be family as well. We have a very welcoming and supportive environment. From our front staff, to our massage therapists and doctors, what’s in your best interest is always our priority. We will never bully you or make you feel “wrong”, we will simply coach you in what you need to do to get results and stay well. We will always tell you what you need to hear, in a caring and gentle manner, and we will always respect your decisions. We simply want what’s best for you. My husband, Gerald, and I live in Marysville, where we have raised two beautiful daughters. With the hope that one day we will have grandchildren, it has been our personal goal to keep fit and stay healthy for them. We are following the Creating Wellness Plan, eating a nutritious diet, exercise and most important, getting a chiropractic adjustment on a regular basis. So from our family here at Fredericton Family Chiropractic: A Creating Wellness Centre, I invite you and your family to come and see us and join in the our chiropractic lifestyle; Be Fit, Eat Right, Think Well and Get Adjusted!